I love October! The weather turns cold, the fall colors are in full swing and I get to recommend monster books all month long! 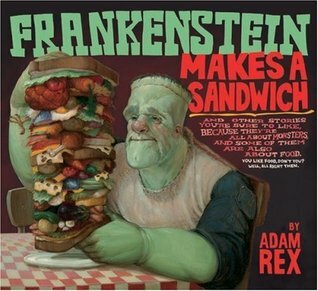 Frankenstein Makes a Sandwich is one of my favorites. You can’t go wrong with short, illustrated poems with titles like: The Creature from the Black Lagoon Doesn’t Wait an Hour before Swimming, The Invisible Man Gets a Haircut, and Count Dracula Doesn’t Know He’s Been Walking Around All Night with Spinach in his Teeth. The poems are well written, lyrical verses that put monsters made famous in various forms of popular culture into hilarious, everyday situations. Children and parents will find Adam Rex’s quirky sense of humor delightful and not too scary given the subject matter. The poetry varies in style depending on the subject, as do the amazing illustrations. Rex works in several different mediums for the illustrations in this book so that each poem is given unique illustrations to accompany it. Jekyll and Hyde appear in the style of an illustrated newspaper, a photo collage is used to interpret Godzilla and even a Richard Scarry-esque bunny makes an appearance as the Yeti. The variety in style and intricate, often humorous, detail of the art work is what will have readers reaching for this book for multiple readings. If you are looking for an extra special way to enjoy Frankenstein Makes a Sandwich, check out the CD in a bag and enjoy listening to the narrator’s interpretations of each of the poems. If you’ve read Alice in Wonderland, you might recall that when Alice first meets the White Rabbit, for some reason he thinks that she’s his maid, Mary Anne. Who IS Mary Anne? Where was she when Alice was in Wonderland? And what happens to her after Alice leaves? And what do all of the denizens of Wonderland think of Alice, given the wake of destruction she left behind her? Kovac has created a wonderful world visually reminiscent of–but not derivative of–the Disney version of Alice in Wonderland, but full of the references to the original books by Lewis Carroll. Mary Anne, a girl obsessed with being tidy, finds herself on the run from the vicious Red Queen. Her only companion is her sentient, talking feather duster/bird, and her rollicking trip takes her down a treacle well, away from the Jabberwocky, and into a meeting with a mysterious new queen that no one has ever heard of before. If you like well-written characters, amusing stories, Cheshire cats, and, of course, nonsense, this hilarious graphic novel is definitely for you. Just in time for Halloween, here’s Eileen to talk about Can rats swim from sewers into toilets? : and other questions about your home by Alison Behnke. As the weather turns cold, our thoughts turn to warm things such as soup. A funny story to read aloud on a cold fall day (or any day) is Duck Soup. Max the duck is looking to create a soup masterpiece, but an ingredient is missing. While he goes to look for the missing herb in the garden, the other pets come looking for him. When they find a feather in the pot of soup, they fear the worst and panic and pour the soup into the drain hoping to find their friend Max. The illustrations add to hilarity and fun. October’s bright, clear weather offers the perfect time for bike riding around town. But even if it’s cold and gray, or you’ve got a flat, reading Tillie the Terrible Swede: How one woman, a sewing needle and a bicycle changed history by Sue Stauffacher would be a wonderful way to spend a few fun-filled minutes by yourself or with your family. Not only is Tillie’s a story of local interest–she began her riding/racing career in the Chicago area–it’s a tale of self determination, strength and “intestinal fortitude.” A young immigrant seamstress, Tillie scandalized her family, friends and acquaintances by taking up bike riding back in the 1890’s. Then she blew the top off propriety by designing a “skin tight” cycling outfit and competing in long distance races. The absolute end though, was how strong she became as a result of all her exercise. She developed muscles! Imagine…it was unheard of. Though now that you know about her, it would be terrible if you missed Tillie. The colorful illustrations by Sarah McMeneny lend a very nostalgic appeal. This is a book that “wheel” please you. “Anna Hibiscus lives in Africa. Amazing Africa.” So begins each new chapter, each new small adventure of Anna Hibiscus, who lives with her extended family in a big, beautiful compound on the outskirts of a bustling city in Africa. There are always cousins to play with, aunties and uncles to talk with, fruit trees to climb, and (unfortunately) naughty twin baby brothers to look after. This sweet and warm family story offers a glimpse into everyday life for a modern middle-class African family, yet Anna’s joys and troubles are so universal that kids anywhere will be able to relate to her. The first in a series of early chapter books by Nigerian born author and storyteller Atinuke, Anna Hibiscus is a charming book that would be a good choice for kids just transitioning into chapter books, or for a family or classroom read-aloud. When something bad happens it can be compared to pickle juice on a cookie, or perhaps to a spiderweb on your leg or even to the black parts of a banana. I’ve never had pickle juice on a cookie, but it certainly sounds really bad to me. Eleanor is having a really bad August. Her babysitter, her beloved Bibi, has moved far away. Bibi has been her only babysitter and no one knows about Eleanor the way Bibi does. Everything reminds her of Bibi. To make matters worse, her best friend is away on vacation and won’t be back until the day before 3rd grade starts. Sigh. . .August is really bad. Natalie is Eleanor’s new babysitter. She is nice, but she is not Bibi. But she does understand how Eleanor must be feeling with the loss of Bibi. Maybe, just maybe, Eleanor and Natalie can have fun in new ways. This sweet book about change reassures the reader that change doesn’t always have to be like pickle juice on a cookie.